The information contained on this disc is the result of many years research by Frank Andrews. He scoured gramophone trade publications, archival material at the British Library and surviving catalogues and supplements that were in the hands of collectors. This method whilst giving basic details of the performer and the material recorded gave no other information apart from a catalogue number or, in the case of single sided issues, the face numbers. 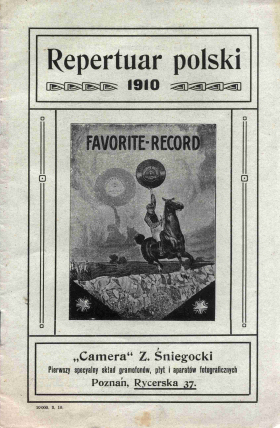 Thus, in order to obtain the other discographical material essential for a catalogue reconstruction it was necessary to enlist the help of record collectors everywhere, as well as noting information from any Favorite record that he happened to see. Favorite records are unusual in that many carry a recordings date on the label, so this needs noting along with the face number and master number with its letter suffix. It seems almost unnecessary to say, but neither Frank nor myself have seen the vast majority of the records documented here. Information has come to us from numerous collectors, not all of them discographers. There is a sub-conscious tendency to correct errors on a record label, a desire to report what should be there rather than what is. Master numbers and their suffixes are imprinted in very small type and it is easy to make an error, likewise with the dates on the labels. So, when the information was put in to its present form a number of anomalies and contradictions appeared. Duplicated face and master numbers were found as was contradictory information of what was issued under a catalogue number. Every effort has been made to resolve these problems, but it has not always been possible. We would therefore urge all who buy this CD to carefully check the information on any Favorite records they may have against what we have shown. In the case of face numbers used for British recordings, that is those starting with a ‘6’, we have given numbers about which we have no information. It may be that Favorite allocated a face number for every master number, so that if the master went unissued then the face number also remained unused. However, it is entirely possible that these ‘unissued’ items appeared on client brands or those catalogue numbers about which we have no information. Artist’s names are listed by surname, then Christian name or initials, then with a performance description, provided we know. If we know what the accompaniment is we show it. If the name on the record label is pseudonymous we give the real name, if we know it. Sometimes the artist’s name on the record label is prefixed with Mr. Miss, Madame, etc. In most cases we have not shown this. The song and music listing retains the indefinite article (a, the, an) at the beginning of the title rather than at the end. Therefore one should look for “The Diver” rather than “Diver, The”. Where the song or music is from a larger work, that primary work is enclosed in quotes, so a typical entry reads “A Midsummer Night’s Dream” - Wedding march, which has the effect of grouping performances in what we believe to be a more useful way. Sometimes the record will give a full composer credit, sometimes a partial one and often no credit at all. We have used various sources to try and fill in the blanks so that where possible we have given what we believe to be the correct composer credit(s). In those cases where we feel uncertain or just don’t know we have left the column blank. We have taken the view, not shared by all other discographers, to give information that is not necessarily given on the label. We have referred to our decision to give composer credit details but we also give the Christian names of artists even though they do not appear on the label, similarly accompaniment details are not always given but if we know them it seems perverse not to pass this information on. The recording ledgers for Favorite, along with hundreds of other labels, have long since disappeared, only the investigations carried out by discographers will ever uncover, if only partially, their activities. If we know a fact that may be of use to someone then we feel we have a duty to pass it on. 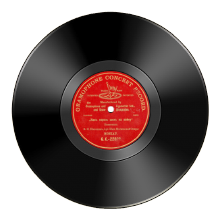 The activities of gramophone record companies reveal the culture of their time as do contemporary newspapers, books and magazines. They hold up another mirror to their age and so, we believe, need to be documented. You will note many items that originated in Sweden, The Netherlands, Belgium, Austria, The Russian Empire, etc. but every record in this list was advertised as being available for purchase here in the United Kingdom, either in a catalogue or a trade advertisement. An ‘E’ suffix after the face number shows that the item was a special pressing for the UK market. It seems almost certain that provided a customer knew of the existence of a particular recording he could place an order for it with his dealer who would be able, through the national agent, to order a copy. This service was available from EMI and Decca in the 1950s so it seems entirely possible that Favorite could offer the same. Naturally we would ask everyone to check. 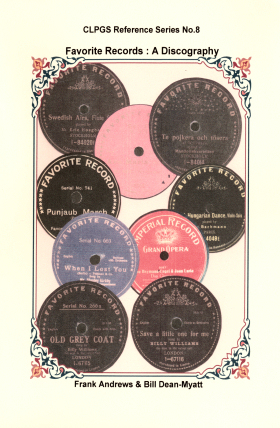 all Favorite records in their collection against our listing, but we would also like them to look at Philharmonic, John Bull and other labels which also used Favorite masters. These labels could well fill in some blanks but they could also reveal masters never used on the parent label.